Since the release of Intel’s Skylake/Z170 platform, demand for higher speed memory kits has risen. 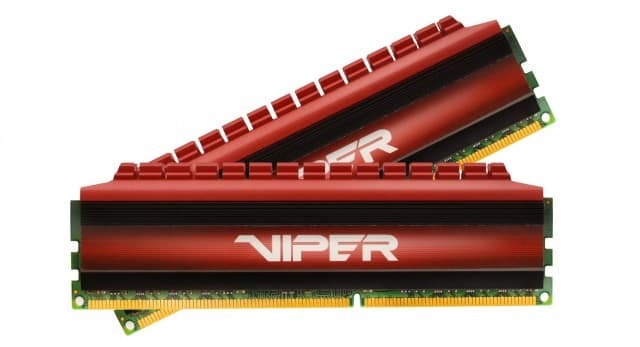 Looking to keep pace, Patriot Memory has announced a new DDR4 3400 MHz Viper 4 dual-channel memory kit designed specifically for the new platform. Here is the press release we received this morning. Patriot, a leading manufacturer of computer memory, USB/flash memory, SSDs, and mobile accessories, today announced the extension of their Viper 4 series of DDR4 memory with a new 3400MHz dual kit designed for the latest Intel® Skylake core processor and Z170 motherboards. The Viper 4 series of Patriot memory was originally launched in January of 2015 and included 16GB and 32GB quad kits that ran at speeds of 2400MHz to 3000MHz pulling 1.2-1.35 volts. Patriot continues to expand their trademark line of memory designed with gamers, content creators and overclockers in mind by adding 8GB (2x4GB) and 16GB (2x8GB) dual kits with speeds ranging from 2400MHz to a top speed of 3400MHz to their Viper 4 line of memory. Designed with a high performance custom heat shield structured to withstand the most taxing PC environments and provide continuous stable performance, the Patriot Viper 4 3400MHz dual kit (2x4GB) clocks in with 16-18-18-36 timings and pulls 1.35V of power. Pick up the timings with the Viper 4 3200MHz dual kit and see how far you can push the limits with tested timings of 16-16-16-36 packed into 8GB (2x4GB) and 16GB (4x4GB) Viper red kits. Revitalize your PC with the Viper 4 dual kit and experience record responsiveness and unsurpassed performance. The Patriot Viper 4 dual kits (2400MHz – 3400MHz) will be available on September 4, 2015 in stores and online at Fry’s Electronics, Newegg and Amazon for a starting MSRP of $64.99 – $169.99.